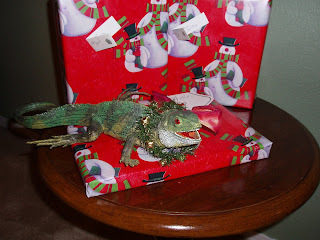 Iggy the Christmas Lizard does his annual job of guarding the household presents. I fixed Iggy's antlers. You need to take another picture. Actually, Karen, that is our Christmas Tree, or as close as we are going to get to one this year. So that is in fact a present for Bob. And one I know he'll like.